New Opening announced, thanks kaze1028 for the pic. New Opening begins in Chapter 517, 2nd October. More information, thanks to Greg in Raftel Forums. You might be interested to know the team who created the song is exactly the same as the team that created We Are! and I'm not just talking about the singer. The article dubs them a so-called 'Golden Team'. Also, although hard to make out, it seems to suggest that the new song will start in October and not as previously suggested on September 25th. Last edited by redon; September 13th, 2011 at 10:31 AM. Awesome! Hope the new opening is good. Eccentric hairstyle to say the least. Kitadani Doing the new Op? It's called "We Go!"? Expected on Kitadani doing it, and definitely VERY awesome sounding! Lookin' forward to it. Song title sounds kinda ambitious, like it's "part 2" of We Are. 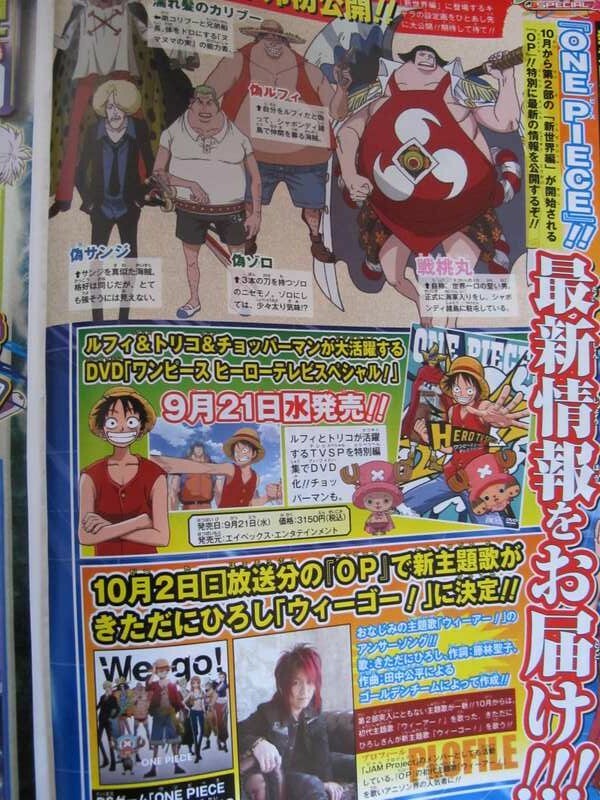 Either way, it's got big shoes to fill if it's gonna become the new "main theme" of One Piece. Looking forward to it. New World is best world. I hope this will be a rocking song!! as for the title "We Go".... I feel like there's going to be a line in the song that goes "here We Are, here We Go!" Oh HO! this scan just made my morning. Part 2's first opening song is by Kitadani? That's the best possible move Toei could have made, awesome! LOL @ Caribou's head being cut-off in the scan. Poor caribou, he can't ever catch a break. Time machines, where are you? I'm extremely pumped for this! I'm guessing it's going to be a variation of "We Are". Support One Piece in the UK! Buy One Piece on DVD from Manga Entertainment! I wonder if the episode preview BGM will change from the 'We Are' to the 'We Go' Melody?